"Trance", Danny Boyle's new thriller, is slick, silly, and frequently very entertaining. Its vibe is twisty and pulpy. Its style is candy-colored visual escapism — every shot hyped up for maximum pop. Viewers who get hung up on story logic — or prefer movies that feature at least one sympathetic character — will spend much of "Trance"'s 101 minutes gritting their teeth. The movie opens with a London auction house being robbed at gunpoint. Assistant auctioneer Simon (James McAvoy) is tasked with taking the auction's most valuable item — Francisco Goya's 1798 masterpiece "Witches in the Air" — to safety. On his way to the auction house's basement vault, Simon is intercepted by head robber Franck (Vincent Cassel). Franck knocks Simon unconscious and grabs the painting — or, rather, what he believes to be the painting. Once inside the getaway car, he discovers that the canvas has been cut from its frame. In a movie that runs largely on outlandish plot twists, it hardly qualifies as a spoiler to reveal that Simon was in on the robbery. The problem, though, is that the knock on the head delivered by Franck has made him lose his memory; he can't remember where he hid the painting, or even why he hid it. After torture proves ineffective, Franck decides to try a more unorthodox method: hypnosis. He hands Simon an iPad ("Trance" is sick with Apple product placement) and lets him pick out a hypnotherapist. He chooses American expatriate Elizabeth (Rosario Dawson) because, he says, he likes her name. It doesn't take long for Elizabeth to figure out that Simon isn't really looking for his lost car keys. She confronts the gang and makes Franck give her an equal share in exchange for retrieving "Witches in the Air." Simon, she says, can't remember what happened to it because of repressed anxieties. Finding the painting means first figuring out what makes Simon tick. It goes without saying that Simon turns out to be more than just a patsy, and that Elizabeth's motivations go beyond wanting a break from the monotony of treating overeaters and premature ejaculators. Part of what makes "Trance" entertaining — if not especially believable — as narrative is its go-for-broke nihilism. Its plot plays fast and loose with the audience's sense of the characters, some of whom go from sympathetic to downright scary. 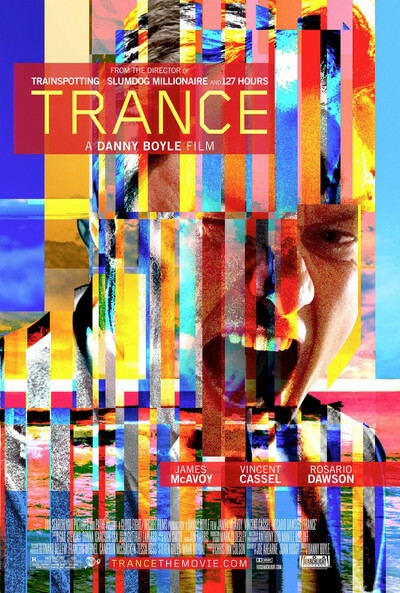 "Trance"'s major problem is also its selling point: It's a Danny Boyle movie. Shot by Anthony Dod Mantle — who won an Oscar for his work on Boyle's "Slumdog Millionaire" (2008) and has shot all but one of the director's features since "28 Days Later" (2002) — the movie has all of the hallmarks of a digital-era Danny Boyle flick: hyper-saturated colors, deliberately mismatched angles, and eccentric compositions that disorient the viewer without ever embracing Tony Scott-style abstraction. While not as visually kaleidoscopic as "Slumdog Millionaire" or "127 Hours" (2010), "Trance" is still a lot of fun to look at. It has the sort of manic energy that makes Boyle's movies so interesting; unfortunately, it also has many of the flaws that make them so frustrating. It's no coincidence that most iconic moments in Boyle's work — the "Choose life…" monologue from "Trainspotting" (1996), the zombie attacks from "28 Days Later" — involve the characters running. Boyle is a sprinter: His movies start out fast and energetic, but can't sustain the pace for too long. His career is full of films that are great for the first hour and then devolve into generic blandness ("Sunshine" (2007) and "The Beach" are two of the most obvious examples). While "Trance" never falls apart, its closing stretch involves several shifts in emotional perspective that the movie doesn't really pull off. To make matters worse, Boyle ends the whole thing on a sentimental note which doesn't jibe with the nihilist tone of the final act (this is also a common Boyle problem). The awkward shoehorning of Big, Serious Themes into the pulp premise doesn't help, either. However, if you can look past the sputtering conclusion — or the pseudo-intellectual banter about memory, modern art, and other assorted nonsense — what you'll find is a brisk, breezy, style-heavy crime flick that happens to be one of the most purely entertaining movies Boyle has made in a long time.